Specific Tab – Specific Hint? The Hint and ShowHint properties specify whether the control displays its hint when the mouse pointer rests momentarily over the control (when ShowHint is true). For TTabSet and TTabControl there’s only the Hint property you can set and this hint will appear for the entire control – not taking into account the selected tab or alike. If you use tab controls you might need to display different hints when the mouse hovers over a specific tab of the tab control. 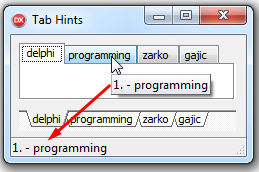 In the Delphi IDE there’s a tab control with 3 tabs “Code”, “Design”, “History”. Would it not be helpful if a hint would appear when you code and hover your mouse over the “Design” tab – for example to “hint” the name of the form you are working on. If you need to change the hint of the tab control taking into account where (over what) the mouse is, here’s how to do it. In the OnMouseMove event handler the Hint property is changed to provide the name of the tab the mouse is over. The code uses the ItemAtPos method of the TTabControl to get the index of the tab under the mouse. When the mouse moves from one tab to another we have to cancel the “popup” hint display – for this purpose I’ve added a writable constant oldPos to remember over what tab the mouse was when hint-for-tab was changed. The TStatusBar Delphi control displays a row of panels, usually aligned at the bottom of a form. The AutoHint specifies whether the status bar’s text is set automatically to the current hint, if SimplePanel property is set to true. When AutoHint is true, the status bar automatically responds to hint actions by displaying the long version of the hint’s text. If multiple panels are defined in the Panels property, the auto hint would go to first panel. If you want the current hint to be displayed in some other panel, as needed per your application design (something else displayed in the first panel) you might want to display auto hints in some other panel of a status bar. That’s it. Now each tab has its own hint (displayed in a specific panel of the status bar). StatusBar1.Panels means it goes to the second panel. With only one panel defined I get a List index out of bounds exception. Yes, I’ve added a comment to the code that at least two panels are needed in that case. and hints do not pop up AT ALL in a TabSet. I even created a fresh one with no MouseMove event, just straight, with Hello World typed in Object Inspector – Properties – Hint and with ShowHint set to True. I am using Delphi XE on Windows XP . Hi Andrew, thanks for noticing. I was concentrated on the status bar display (as that’s what’s important for me). I guess no hints for TTabSet is some issue with the control itself (as even without this OnMouseMove handling, the Hint does not appear for TabSet). As for hint not being changed when you move between TabControl tabs – I’ve rewritten the code in a different way to handle this.